A Fish Out of Water: Happy New Year! May you all have a wonderful 2011! Merci pour cette adorable carte de voeux! Je vous souhaite une année 2011 au moins aussi merveilleuse que 2010! Que du bonheur pour l'adorable petit Shuma et sa famille !! J'ai toujours autant de plaisir à parcourir votre blog. Japon, recettes et à présent le plus beau des poupons ... Merci! Akemashite Omedeto Amy. Beautiful baby and Nenga card. I came across your blog and this caught me smiling cause we have a lot in common. We love writing and taking photos about "our life" here in Japan. I hope I meet you someday, or in Facebook. so cool! happy new year! 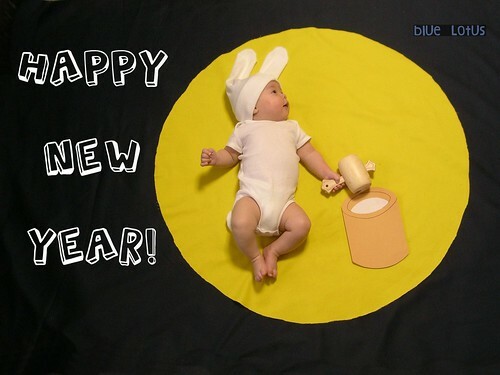 Happy new year, love the rabbit beanie! he really is the most adorable infant. nice work and happy new year! Adorable picture, briliant idea!!! Happy new year! Lovely photos all along, adorable. I found your details on your blog, I hope you might be able to help me with my strange request! House Hunters International is a half-hour program currently airing on the Home and Garden Television Network (HGTV). The program is a spin-off of the popular House Hunters and has spent the last several seasons exploring the idiosyncrasies of buying real estate in other countries. HHI is about a personal journey of discovery and the making of life-long dreams. The series is designed to de-mystify the international home-buying process by going behind the scenes of a house hunt where buyers and their real estate agents tour 3 homes. At its core, House Hunters International is a travel show concentrating on the idiosyncrasies of the locales and what makes them special and different. A great deal of effort will be made to capture rich visuals and to provide sequences where viewers will be exposed to local vistas, traditions, lifestyles and architecture. Please get in touch if you have any more questions about the show. I look forward to hearing from you!